Note: You can enter this giveaway three (3) times per e-mail address per day. Deadline is 11:59PM ET 11.23.17. This 10-piece ceramic cookware set will have you seeing red in the best possible way. 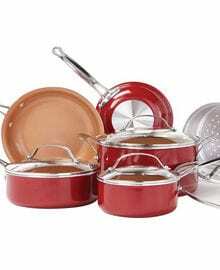 Red Copper cookware’s ceramic non-stick coating is resistant to high heats, free of PFOA and PTFE, scratch-resistant and won’t peel, chip or flake. Whether you choose the 8- or 10-inch fry pan, or the 1.5-, 2.5-, or 6-quart sauce pan, you’ll be able to cook without oils, sprays or butter when making Pan Seared Chicken Breasts. The pans can also go from stovetop to ovens up to 500 degrees F, making them perfect for chicken Parmesan, Pan Roasted Halibut and more. To complete the set, you also receive lids for the saucepans, a lid for the 10-inch fry pan, and a steamer insert. NO PURCHASE NECESSARY TO ENTER OR WIN. Void where prohibited by law. Open to legal residents of the 50 U.S., D.C. and Canada (excluding Quebec) who are at least eighteen years old at the time of entry and have internet access. Begins on 9.28.17 at 12:00:00 a.m. ET and ends on 11.23.17 at 11:59:59 p.m. ET. To enter the giveaway, submit your full name and email address on this form. Odds of winning this giveaway depend on the total number of eligible entries received. Only three (3) entries per email address per day. Sponsored by Leite’s Culinaria, Inc. For more information, visit our Official Rules. For a list of winners, check out our Very Happy Winners page. Be sure to add giveaways@leitesculinaria.com to ensure notification if you are the winner.